I’m not going to lie: paragliding was more terrifying than I was expecting it to be. Long ago, I tried parachuting, and actually found it to be the less scary experience. Jumping out of a plane isn’t easy, of course, but it was less nerve-wracking than running off the top of a mountain and hoping that the wind catches you. 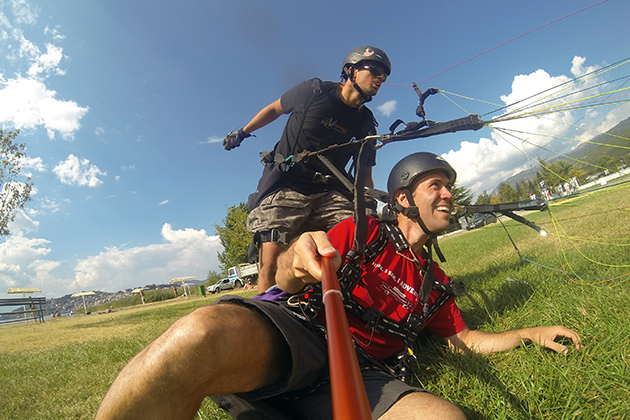 After strapping into the harnesses with our tandem instructors and receiving a crash course in paragliding basics, we ran. I went first, sprinting down the hill as fast as my legs could propel me. Within four or five steps, I noticed that my feet were no longer touching the ground. 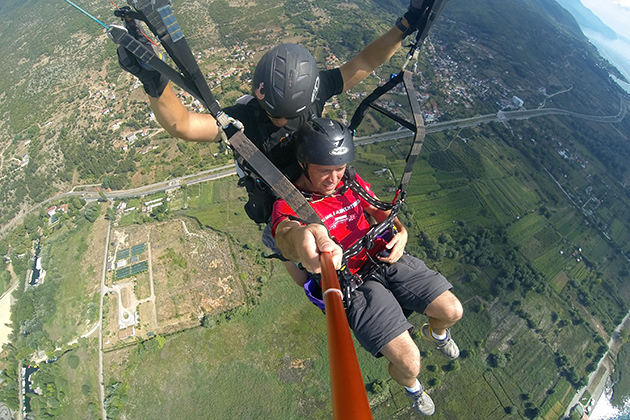 A few seconds later, my instructor and I were at least ten meters high. Luckily, I had nothing to worry about. We had immediately hit a thermal wind which brought us soaring up into the atmosphere, and from this altitude, the view I had of Lake Ohrid was insane. Despite my fears, I must have been enjoying the experience. The proof is on the camera which Vertigo had provided. It was automatically taking pictures every ten seconds and, whenever I showed up in a photo, it was with the stupidest grin imaginable. After a flight of about twenty minutes, we touched down in a grassy field outside Ohrid, as smoothly as I could have hoped for. After disengaging myself from the harness, I looked back into the sky and spotted Jürgen, still soaring above the lake. As he approached for his landing, I saw that he was also sporting a ridiculous grin. 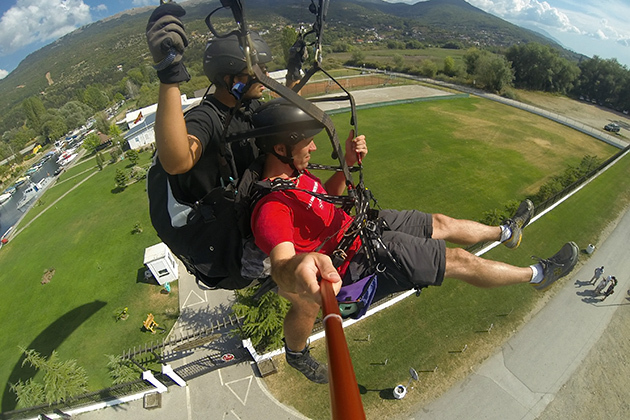 Vertigo has been operating near Lake Ohrid for twelve years. The guys who run the operation are strictly professional, and will cancel paragliding trips whenever the winds aren’t right. That had actually happened to us on the first day we attempted to paraglide. Disappointing, but the day wasn’t a total bust, because we instead spent an entertaining afternoon hanging out with the Vertigo team at Cuba Libre, the bar from which they operate. These guys are hilarious, and a lot of fun to be around; they seem to be in permanent good moods, and it’s not hard to imagine why. Running a paragliding company must be their dream job. Now, we’ve checked “Paraglide” off our lifes’ to-do list. Of course, we’ve already added a new item to the bottom of that list: “Paraglide Again.” This is the kind of experience you could immediately get addicted to, and one we’ll almost surely be repeating. 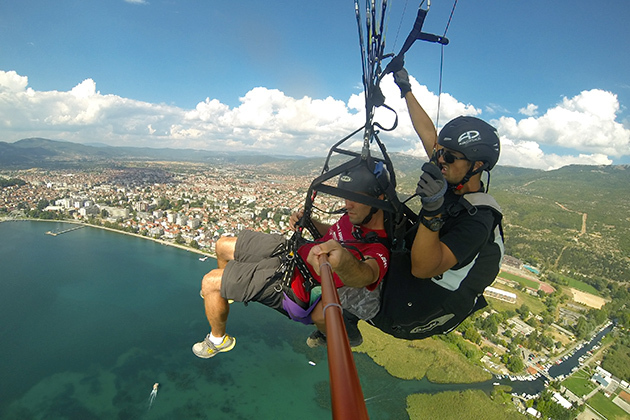 If you’re in Ohrid, and are interested in trying it yourself, look up Vertigo. Their table is usually set up at Cuba Libre; ask at the bar, if you don’t see them. 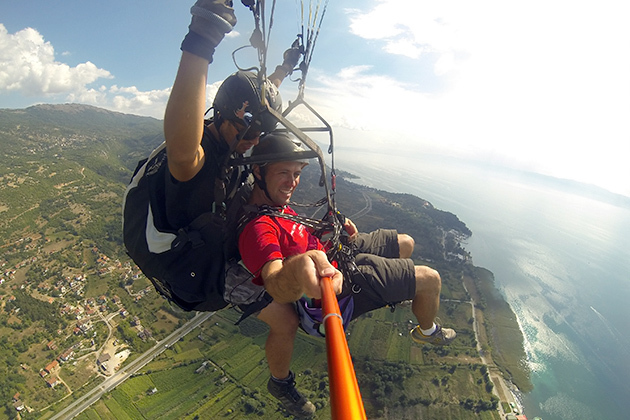 Paragliding Over Lake Ohrid Frequently visible in the skies above Lake Ohrid are paragliders who have jumped from the mountains of the Gali&ccaron;ica National Park. 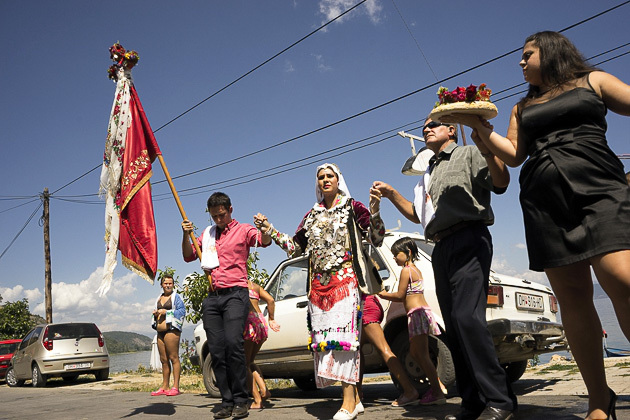 It's an activity we've always wanted to try... why not in Macedonia? 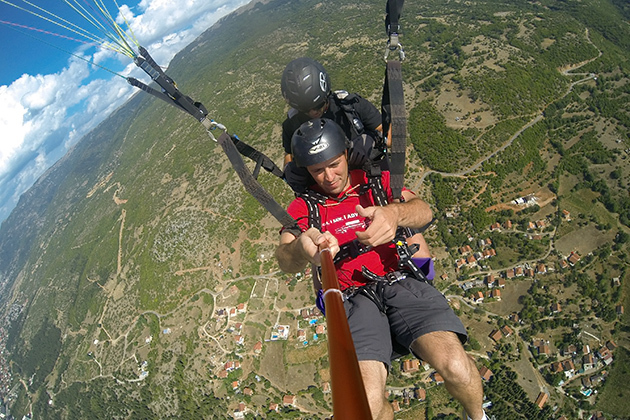 So we gave the guys at Vertigo Paragliding Club a ring. A couple days later, were bouncing up the mountain in a jeep, nerves beginning to tickle our stomachs. This was a good idea, right? Very cool! I did a tandem skydive a few years ago. 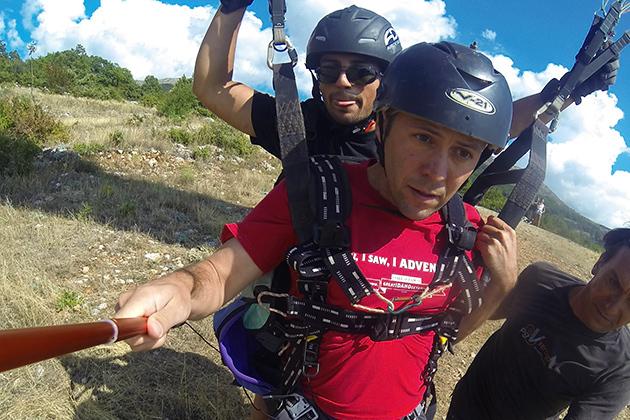 I think the idea of jumping from a plane is that you are committed once you roll out head first! Running and jumping, I think I might hesitate! But wow! There is no view like it, huh? And you got to enjoy it, unlike when you are free-falling at 120/mph until the chute deploys! I would try it…at least once! Hi Guys the title of your video is wrong. 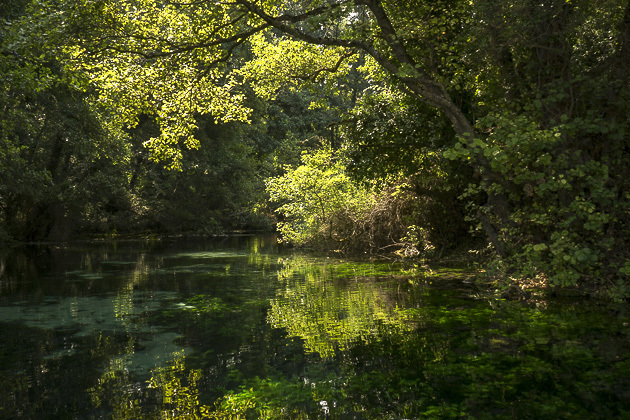 It is not the Prespa lake it is Ohrid. Otherwise, as usual, very good job. Thank you for catching that. Fixed it!!! 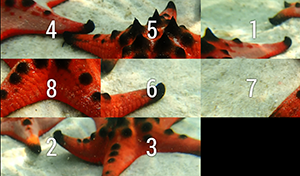 Hello,the pictures are awsome! I consider of trying to do the same this summer in Ohrid. Can you tell me a approximately price?Thanks!